British artist, creator of costumes and sets for the theater and music hall. He was active between 1930 and 1955. He too was very influenced by art deco. Drawing: theater costume project or music hall. Gouache + silver paint + pencil. 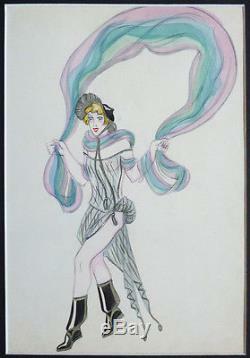 Unsigned drawing, attributable to alec shanks or h. Art Deco period, circa 1930. Size: 30.8 x 20.8 cm. Hand delivery possible paris 9th. The item "opera theater costume original drawing 1930 art deco alec shanks or fost" is on sale since Thursday, October 8, 2015. It is in the category "art, antiques \ art of the twentieth, contemporary \ drawings, wash".